Trying To Be Thoughtful: What, Indeed? 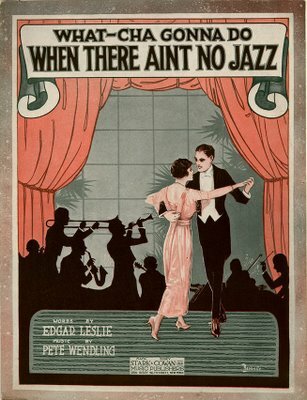 I love early 20th century sheet music covers. They got pretty boring by the fifties, but the early ones - starting with the ragtime craze - were just beautiful. Just as pop music began its descent, so too did sheet music go into its decline. It could truly be said that the covers' charm was, for the most part, commensurate with that of its innards! 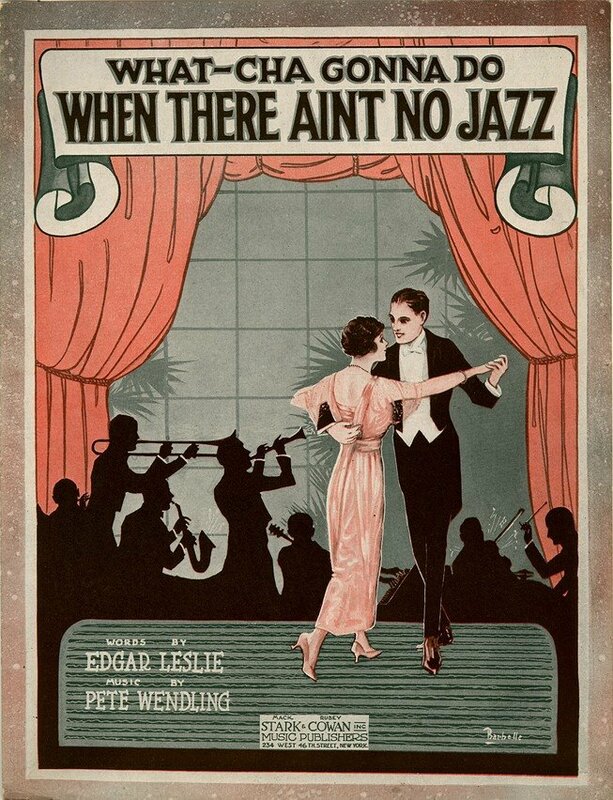 For me, the art form reached its pinnacle during the 20's and 30's; not coincidentally, perhaps, American popular music was also at its zenith. The romantic look, as exemplified by your WHAT-CHA GONNA DO WHEN THERE AIN'T NO JAZZ (with its glamourous dancing couple and beautiful orchestra silhouette) gave way to the Streamline Moderne look, with its bold graphics and motion/speed motifs, which adorned everything from baking powder containers to lipstick advertisements. The use of color during that period was also interesting. Bold oranges, reds and blues were juxtaposed with pale, washed out blush shades (similar to the hues of the early color Warner Brothers cartoons) and shades of gray. The period look was, in general, simply grand and worthy of the songs depicted!